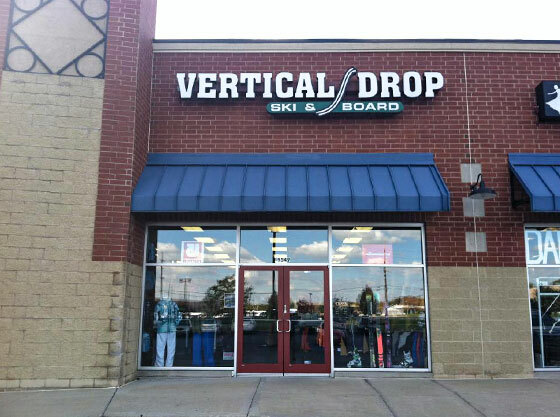 Started in 1976 on High St, directly across the OSU campus, Vertical Drop has grown to become Cincinnati’s premier ski, snowboard, and gear shop. With expert staff and years of experience, we have everything you need to get outside and enjoy life, all in a comfortable, laid back environment. Between our two stores, Vertical Drop at Mad River, and our Loveland location, we are able to access virtually every ski and snowboard brand. Our professional tune & repair shop provides all your service needs for boots, skis, and snowboards. Our goal is always to remain true to the core of the sports we love, and provide you with a fantastic customer experience. You won’t find any khaki slacks and polo’s here because we don’t just sell it, we live it! In January of 2016, we moved our Loveland location from Fields Ertel to the Historic District of Loveland. This unique location is set right on the Little Miami River and Bike Trail and gives us a unique opportunity to reach our core customers. The Historic District is full of locally owned restaurants and shopping, and we feel right at home! Spring and Summer look a little different around our Loveland location. We do a full store change over to accommodate all of your warm weather activities. Products from Yeti, Kavu, Oakley, Ohio Proud, Elie, Pelica, and more are sure to keep the good times rolling! We are also your premiere dealer of Vibe Kayaks, serving all of the Ohio River Valley. If skateboarding is your thing, we’ve got you covered there too! We have a full selection of street, downhill, cruise/carve, and slide boards, wheels, trucks, and bearings. Please note that because we are a small business that operates on a seasonal basis, our return policy is 14 days for a full refund or exchange. All refunds must be accompanied by a receipt and the same credit card used during the time of purchase, if a card was used. All sales are final on all previous seasons winter gear. No refunds after bindings have been installed on skis and snowboards.